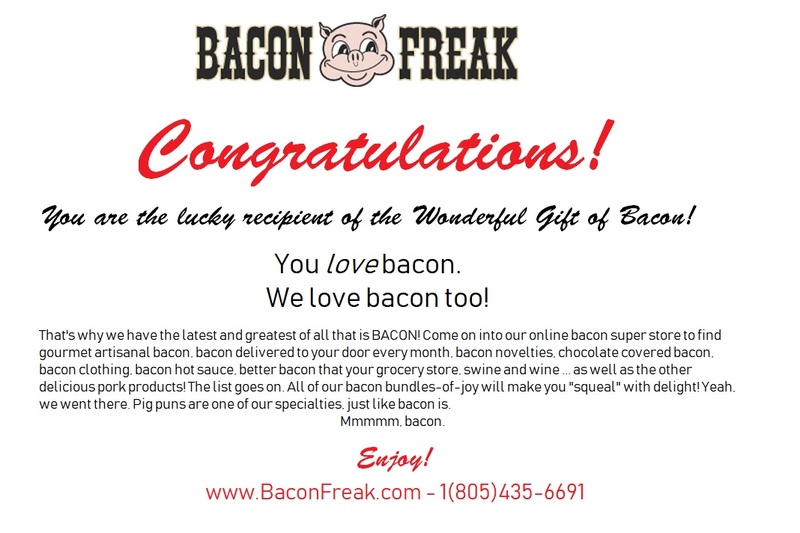 Bacon Freak’s “Bacon is Meat Candy” Bacon of the Month club is one of the original, if NOT THE ORIGINAL, bacon of the month club. This club offers monthly bacon subscription delivery of two packs of bacon, and each month different flavors of bacon are chosen. The bacon we pack each month is artisan, small production batch bacon and the flavor and quality is obvious. From the over 40 varieties of bacon we carry, each month two of the favorite flavors are chosen for that month’s delivery. The first monthly bacon subscription delivery also comes with a 100% cotton tagless t-shirt with our trademark “Bacon is Meat Candy” emblazoned across the front along with our Pork Lord & Master “Boss Hog”. Considered very chic in some circles, we suggest not wearing it in the presence of pigs. Another nice perk of this club is that you can add items to your monthly delivery without paying additional shipping, we call this our “Ride-a-Long” opportunity. Use Coupon Code "RIDEALONG" at checkout and enter the delivery address or order number for your Bacon of the Month Club order.